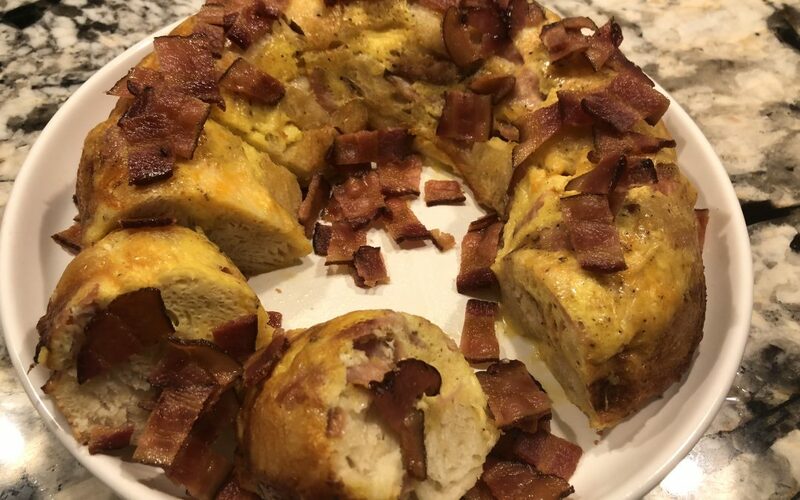 I love making breakfast in a bundt. Whenever I am press for time in the am….I usually prep the mixture the night before and in the morning…I throw it in the bundt pan and BAKE it while I am getting dressed in the morning. So, when I am done dressing…our BREAKFAST is DONE!!! You can change up this breakfast in so many ways. You can add chopped bell pepper, onions, mushrooms, or spinach. 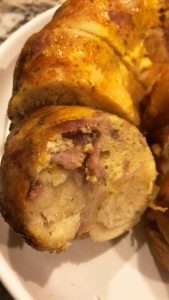 My kids love it with ham, sausage or BACON…LOTS of BACON!!! Its a great way to change it up a little….and its also VERY PRETTY looking. **Put a few pats of butter on bottom of Bundt pan or you can spray with Pam. In a mixing bowl…Mix everything together and let it soak for about 20 minutes. Next, in your prepared bundt pan….pour the mixture in and bake for 30 minutes (place the bundt pan in the middle of the oven) or until the top is golden brown and bubbly. Take it out the oven and flip onto a serving platter…. Serve immediately. ***Top with crispy bacon or sliced green onions. This breakfast is great for if you are on the go because you can slice it and grab it…it holds up very well. SIDE NOTE: You don’t have to wait for the bundt to get cool..you can flip it onto a platter as soon as you can. It should come right off. Flip onto a serving platter. 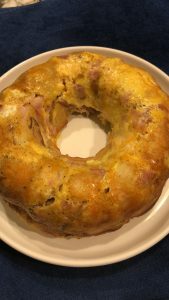 Ham and eggs going all through the biscuit…yummy! !